This month, meet Scott James! I "joined" MetroPets the way most Married Men "join" an organization that their wife is interested in .... I was 'volunteered', by my wife, to assist with MetroPets'"Pets In Pearls" Animal Fashion Show (October 2001). Since then, I've 'been volunteered' to assist MetroPets at several events. About myself: I'm a Life Member of the Naval Institute and have recently retired (21 years of active duty as a Computer Specialist), from the United States Navy. I've always been around animals. Raised in Eau Claire, Wisconsin, I was surrounded by nature: deer, cats, horses, dogs, cows, etc.. Most people, who know me, say I "have a way" with animals. Probably that's because I am very comfortable with most species. My family loves dogs and I had a toy Fox Terrier, of my own, when I was a teenager. I was also extremely fortunate to be exposed to responsible breeding methods, at home. While growing up, I thought that all breeders were like my parents. Our last dog, "Duchess", (who passed-on as our Grand Old Lady, at age 15) a pure-breed,smooth-coat, award-winning Dachshund, had a total of five litters ... her entire life (it was supposed to be four, but she had other ideas and figured out to open the door). My mother only placed puppies with families that she knew. She also kept in contact with the families to follow up on each puppy's progress. If she didn't feel that a family understood the long-term responsibility of dog ownership ... they did not get a dog from her. I now realize that her standards were not the same as someother "breeders". Unfortunately, it's the "other" type that gave breeders the reputation they have today. I'm married to Jeanette Davias and, when I can, I like to assist with the 'dog stuff' my wife signs me up for. I have been representing MPs at assorted Virginia community events (e.g. : Canine Games; Italian Festival, Scottish Games; Super Pet Expo, Scottish Festival, etc.). I do sales and outreach and really enjoy the functions. And, I'm proud to say, my wife & I are the top salespeople, of the Rawcliffe collectibles, for MetroPets. 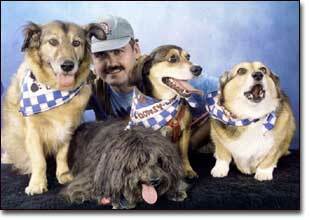 I'm the proud 'doggie daddy' of five mixed-breed rescue dogs: Duchess; Sadie; Milo; Rusty; & Daisy. Our 'fur-kids' are also 'put to work' at events. AND they take their 'job' very seriously and are terriffic at showing people that abused and neglected dogs can make wonderful pets ....with lots of love and attention. People are attracted to "The James Gang" and usually stop to give them scratches and hugs. So the dogs look forward to the events as much as we do! My wife and I (and the 'fur kids') appreciate that MetroPets has given us the opportunityto 'spread the word' for Pet Adoption. We hope that our example has made a few more peopletake in a 'throw-away' animal and give him/her a permanent, happy, home.